Danish Red Cabbage (Rødkål) - The Best and Traditional Recipe! The traditional danish red cabbage also known as Rødkål. This cabbage is traditionally eaten at Christmas time and especially together with Danish Roast Pork with Crackling (Flæskesteg). It is easy to make. 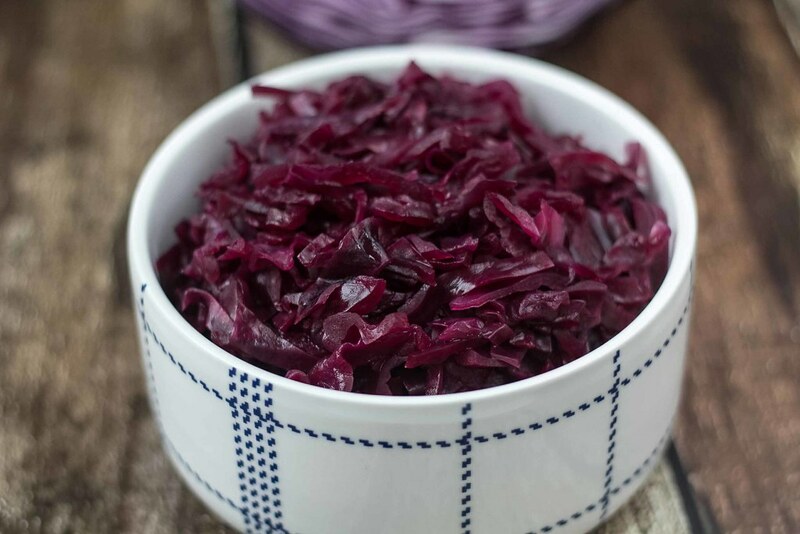 This recipe for Danish Red cabbage is a traditional and very popular side dish for many different dishes. 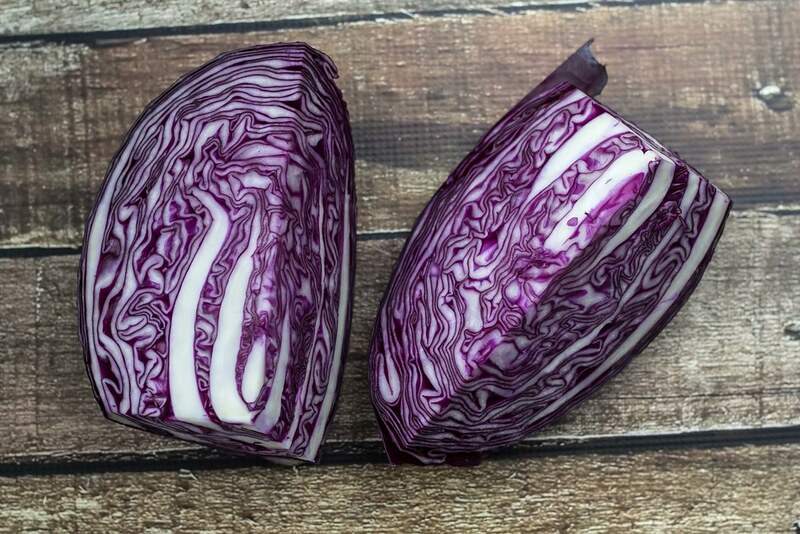 Red cabbage is served all year around, however, it’s very popular at Christmas where it’s served together with the traditional Christmas eve dinner the 24th of December. 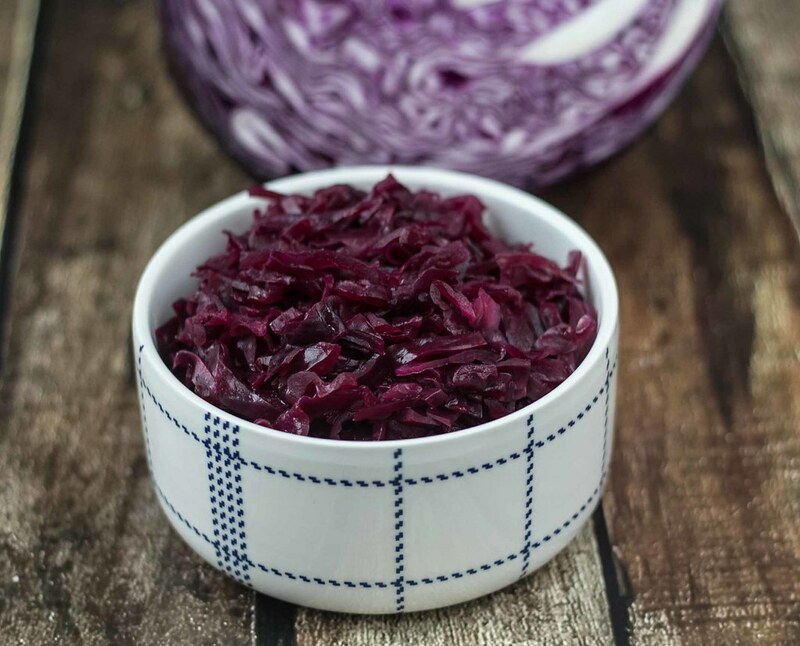 In Danish we call this side dish Rødkål which translated simple means Red cabbage. We have used this recipe several times and its way better than the red cabbage you can buy at the super market. It’s really simple to make and you only need five different ingredients, red cabbage, vinegar, currant juice, sugar and salt. You can easily change this recipe into a more personal dish by adding different spices according to your taste. Normally we would use currant juice in this red cabbage, however, we have sometimes used elderberry juice instead which is just as good. Besides currant and elderberry juice I have also hear from one of my readers that you can use cranberry juice with good results. However, I have not had the time to try this myself yet. 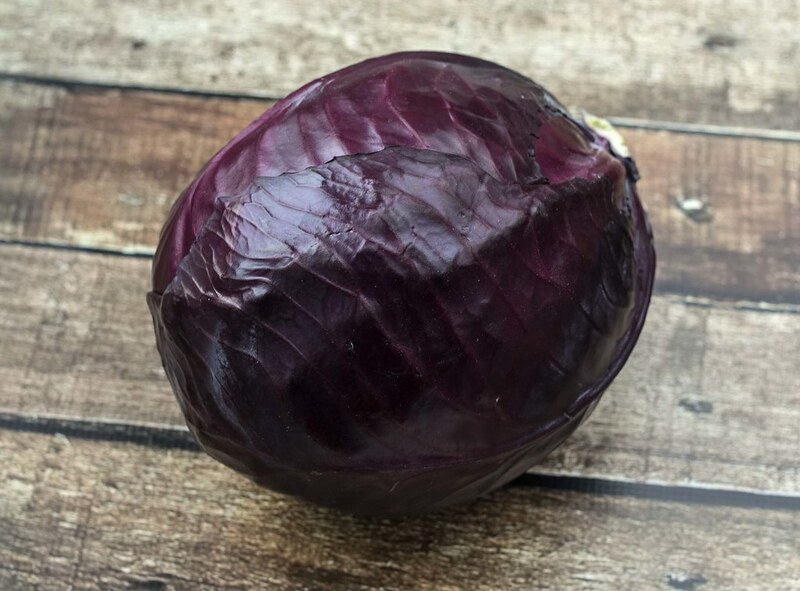 You can make this Danish red cabbage in due time you just have to store it in jars which have been cleaned using boiling water. This will kill all the different bacteria and extend the shelf life. If you have some extra fat from the traditional roasted Christmas duck you can add some of it to the red cabbage, this gives a delicious taste and makes the cabbage shine. Step 1: Finely shred the red cabbage and make sure that the pieces are not too long. Put the shredded red cabbage in a large sauce pan. Step 2: Pour the vinegar in the sauce pan, turn on the heat and let it simmer for about 30 minutes. Stir in the cabbage regularly so that it doesn't burn to the bottom of the sauce pan. Step 3: Add the juice, sugar and salt to the sauce pan and let it simmer for another 30 minutes or until it has the right consistency. The consistency is basically up to you - the longer you cook it the softer you will get the red cabbage. Step 4: Clean some glass jars using boiling water. This will kill all bacteria so that the red cabbage will last longer. Pour the red cabbage onto the jars and seal them right away. Keep the jars refrigerated. Hello Kim and Louise My daughter recently moved to Holte. I just returned from my first trip to your beautiful country. The people are so wonderful and we have fallen in love with your cuisine. I found your website in my search to try and recreate some of the dishes here in Switzerland. My problem is that you do not specify what kind of vinegar you are using. We have cider vinegar and a type of herb infused vinegar. The only white vinegar available is the one from our Asian markets. Would you please tell me what kind of vinegar is the best to use not only for this recipe but for the pickled onions and cucumbers. I love your website and look forward to following you on Facebook. Thank you. For these recipes we use a cheap vinegar. In Denmark it is called ‘lager eddike’. I’m not sure what it is called in Switzerland. But just use a cheap vinegar, that is fine. Am I able to safely waterbath can and preserve this so it can be kept on the shelf? You need to make sure that the glasses it will be stored in are completely clean. If you need to store the red cabbage for a long time I will also recommend that you add some kind of preservative. Oh, I’m so happy to hear that. Hope your husband love the Danish food you’re making him. As the star rødkål maker in a family of native-born Danes I have always had a critical audience to please. I have found that using red wine vinegar and red currant jelly are the bomb-proof keys to success. Also, I use butter instead of duck fat. The resulting rødkål freezes very well so I usually make double batches so that I can distribute it as necessary and retain some as an essential garnish for smørrebrød. When cooking I use a big Dutch oven and just let the cabbage simmer away, adding water as necessary and adjusting the ingredients according to taste. The ritual making of rødkål has become as much a part of Christmas preparations as trimming the tree. Just saw this message chain. I have been making this recipe for 50 years since my own Danish grandmother and great-grandmother taught it to me and to my younger brother. (They were the only Danes in an otherwise Italian family) We had it every Thanksgiving and Christmas. Our family recipe also uses red wine vinegar and red currant jelly, and uses butter initially to coat the cabbage. We then simmer it for hours in a large covered pot or dutch oven, which creates a very familiar smell throughout the kitchen. I usually end up using almost an entire jar of red currant jelly as I adjust for taste during the day, but I generally use a bit less sugar than this recipe (I use 2 tablespoons only), so it probably evens out. It is even better the next day after a night in the refrigerator, then re-heated. Nice to know others enjoy this as well. I grew up with a Danish grandmother who made so many delicious dishes, but never wrote down a recipe. She used to stuff our Christmas bird (turkey, goose, duck) with a combination of bread soaked in evaporated milk, prunes, apples, I believe some parsley-not sure). Do you know of this stuffing? I would love to duplicate it! Hi Jeena. Unfortunately, I don’t exactly know this kind of stuffing. It’s pretty normal that people come up with their own combination of ingredients they prefer. However, I would say that apples and prunes are pretty traditional stuffing for a Christmas duck. I’m sorry that I can help you getting any closer to your grandmothers Christmas duck. Nice recipe! I would love to make it for Christmas. How long does it can be stored without preservatives? Hi Shioka. Thanks for your question. 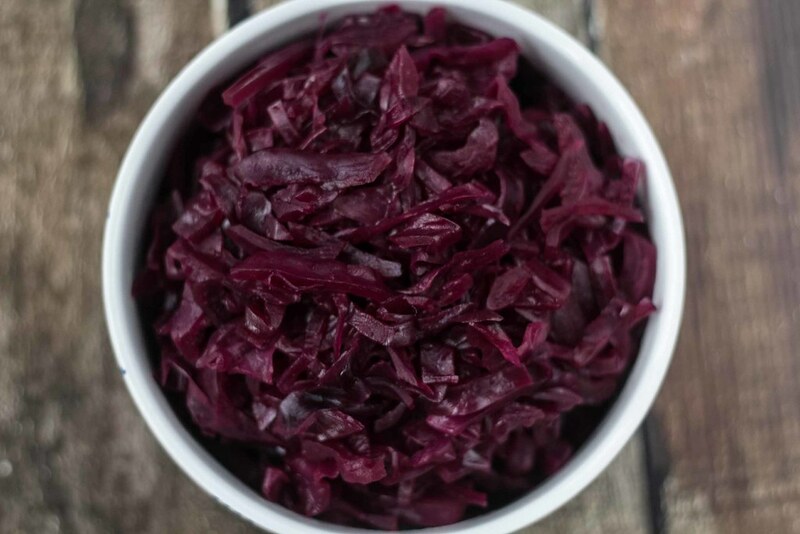 If you remember to clean the glas jar nicely then this Red Cabbage can be stored for long time in the fridge. It’s hard for me to give an exact time – I normally eat it before it turns bad. Can I use cranberry juice instead of currant or elderberry juice in the Danish Red Cabbage? My grandma makes this with apple juice and butter. No recipes, she just throws things in from memory and taste. Thanks for this. I can never get enough of Grandma’s red cabbage at Christmas and am happy I will be able to make some for myself! I cook my red cabbage recipe in a crock pot on my patio all day because the vinegar smells up the house.. I forgot to mention that I chop up a couple of apples and add it to the cabbage. My parents immigrated to Canada from Denmark in 1952 and we have had rødkål every year since. I make mine with peeled thinnly sliced and diced apples instead of the juice. We all love it. I hope my children keep up the tradition when they take over the hosting. I also make aeblekage for desert each Christmas. Tak so maeke. Just really wanted the taste of this for the holidays. Warm wishes. I have just made this dish for our family for our Christmas Eve celebration. My husband is English and loves all Danish food (both my parents were Danish). It turned out delicious with cranberry juice. FYI, my mother always made plenty ahead of time and froze batches of it in the freezer in Tupperware containers. Just finished making my Danish (Horsens) grandmother’s red cabbage. Nice to see that it is basically the same recipe, only she used grape jelly instead of currant juice. I make my own jelly from grapes grown on my husband’s family’s farm, so I feel like we are combining two families’ heritages in one dish. Just made Rødkål for the first time. Being 3rd generation from Denmark, this was not part of my traditional Christmas Eve dinner. I made this recipe and it came out absolutly delicious. I made Frikadeller the traditional way with tablespoons. Gravy, mashed potatoes and all were delicious.. Here in Chicago we have a retirement home that was established by Danes more than 100 years ago – the Danish Old People’s Home – and it has become the center of Danish culture in the area. Every November they have a fall festival celebration where they serve plates of frikadeller, rodkal, agurkesalat, potatoes, and brown gravy. It was this past weekend, was delicious as always, and prompted me to find your site as I now have some medisterpolse in the refrigerator to cook this weekend. Skal! I used a quart of fermented red cabbage (>3 months fermentation time)–steamed it to soften, and then cooled added currants and currant syrup and a touch of clove. In a later recipe, I added chopped apple and walnut–and this is my new favorite. Happy Christmas, and thank you for your recipes! I’ve been cooking up a storm this week with many of your Christmas dishes. I just made a batch of your rødkål, but it seems to have a lot of liquid – a little over half the level of the cabbage in the pot. Did I do something wrong? The adjustments I made to your recipe was using butter and lingonberry jam (I didn’t have any other red berry juice/jam) to replace the duck fat and juice, as suggested in the Comments, Oh, and I also put the lid on while simmering, since I’m an expert at inadvertently burning food. I’m nowhere near Danish (I’m Asian) and I’ve never eaten this dish, so any suggestions would be very much appreciated. Thank you.